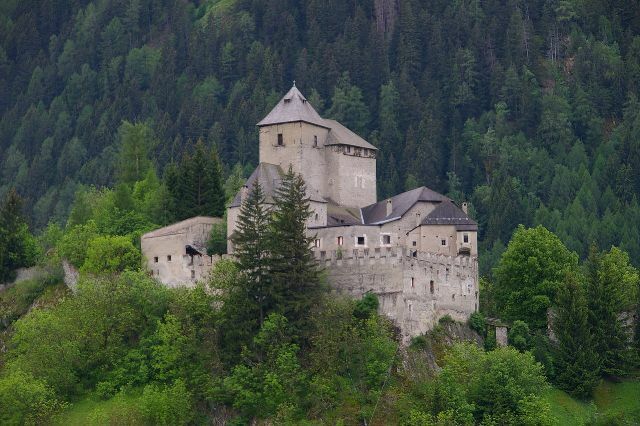 Notes: Reifenstein Castle (German: Burg Reifenstein, Italian: Castel Tasso) is a castle in Freienfeld, near Sterzing, in South Tyrol (northern Italy). It is located near a dried marsh, in the valley of the Eisack.The castle is mentioned for the first time in the 12th century, and was modified in the 14th century. It is a property of the Thurn und Taxis counts. It is famous for the decorated "Green Hall" with Gothic paintings and a woodcarved chapel-door, the stubes and the collection of armor. The castle also contains an original kitchen, bathroom and medieval sleeping bunks. One of its owners included William P. Carr, who bought the castle a bit before the second world war. At that time, his last name was Reifenstein, but before he went to war he changed his name to Carr.